Our theme comes with dummy content, that allows you to setup our theme with thew same look as our preivew. To install Dummy Content navigate to Theme Options -> Dummy Content page at your Dashboard. Warning! DO NOT INSTALL dummy data on your live website. It will corrupt your existing data. We suggest you install dumy data only on clean WordPress setup. 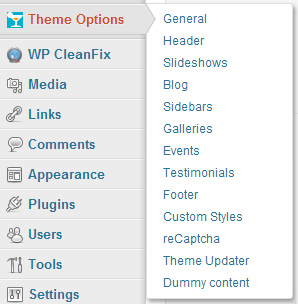 This option is for those who are not very familar with WordPress or don’t want to setup our theme from the scratch. Installing dummy data allows you to see whats behind the scene of our preview and make setting up your website easier and faster. However, if you already have an existing website we suggest you to use our Test Drive. How to Remove Dummy data? You can’t easily remove dummy data, that’s why we suggest you install in only on clean WordPress install. To remove dummy data you’ll need to reinstall WordPress.